Coming off of a back-of-the-pack finish in the Nevada caucus Saturday night, Ron Paul said Sunday morning that it is "hard to say exactly when" he expects to score a victory in an upcoming caucus or primary. 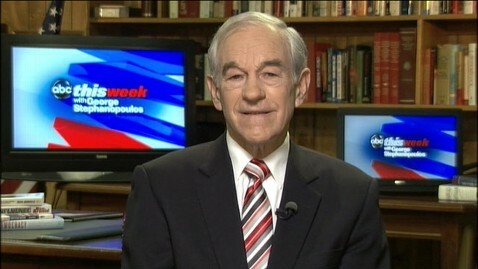 "Of course you set [your target] for victory, but you have to live within the real world," Paul told me on "This Week". "But we have three or four caucus states that we believe our numbers are doing pretty good and we have to wait and see and keep doing exactly what we're doing." Paul, who is the only 2012 GOP presidential candidate who has not won a primary or caucus, said despite his losing record, he has already achieved his goal igniting a "big change in this country." "There is an intellectual revolution going on with the young people," Paul said. "It has not been translated into an absolute political change, but, believe me, there is an intellectual revolution going on and that has to come first before we see big political changes." The Texas congressman criticized his GOP rivals, particularly frontrunner and Nevada Caucus winner Mitt Romney, for having no "firm convictions." Paul said Romney's economic positions were "flawed," but that the former Massachusetts governor is apt to change his tune if it means capturing some of Paul's supporters. "I think Mitt can change his mind," Paul said. "He's changed his mind in the past. If he hears from our young people and voters and we continue this, yeah, he's going - he's going to change his mind, if there's a political benefit to it." With Romney's support still hovering under 50 percent, capturing some of Paul's devout and substantial base of followers could put the wind at Romney's back going into the general election. With 71 percent of the votes tallied, Paul sits at third in the Nevada Caucus, about 1,000 votes behind Newt Gingrich, and falling behind his second place finish in 2008. Paul said his third-place finish in Nevada was a "disappointment," but that the poor showing would not put an end to his campaign. "On the positive side, we will get a bloc of votes. We will still get some delegates," he said. "And we still will pursue, you know, our plan to go into the caucus states." Colorado and Minnesota are the next states to hold their GOP caucuses, both of which go to the polls on Tuesday.